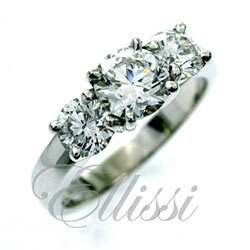 Home / Engagement rings: Custom Design / Round Diamond Rings / “Rosie” bold contemporary design diamond ring. “Rosie” bold contemporary design diamond ring. This ring has a channel set bridge set with 8 diamonds rising to support a round brilliant cut diamond of 1.81 ct G/SI2 in “Excellent” cut. The main diamond is raised above the central channel of diamonds and held with four flat profile claws.